Although generally uninteresting from a tactical perspective, the game did showcase the two differing styles of football by both teams. Unsurprisingly, Villarreal enjoyed more possession than their visitors and had a far better pass completion rate whilst Osasuna won the aerial battles. 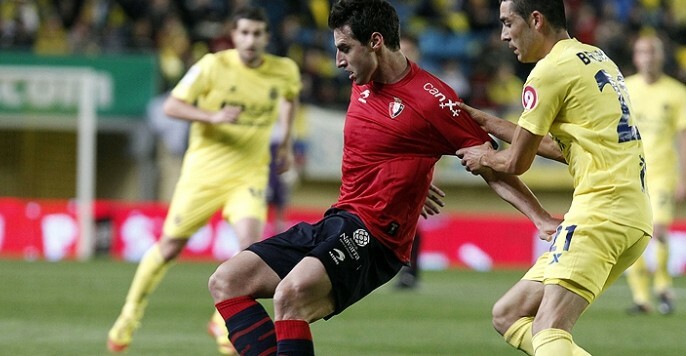 Osasuna have a clear identity and under Mendilibar it has been emphasised. The preference is for a very vertical style of play, using the wings and delivering the ball into the penalty area frequently. A very high defensive line is also incorporated to push the opposition back. Perhaps it was due to this tendency to deliver the ball from wide that resulted in Lotina asking his full back, Mario and Costa to stay deeper than normal. With Villarreal reliant upon their full backs for width over the past few seasons, it was somewhat strange to see such a subdued performance from them. It was expected from Costa, the 3rd choice left back, given that Osasuna are stronger on their own right side but more was expected of Mario on the right. Under Lotina, Villarreal still demonstrate patches of their intricate short passing game honed under Pellegrini. It is a style that is somewhat inevitable when you have technical players like Borja Valero, Bruno and Senna in your team. With the inclusion of Hernan Perez on the wing, Villarreal can be more direct. What is clear so far is that, in the midst of a relegation scrap, Lotina is taking a safety first approach. He is a fairly conservative manager. From 8 games under the guidance of Lotina thus far, Villarreal have 2 wins, 5 draws and 1 defeat; slow, but steady progress. With 46% of their goals so far this season the result of a set piece, it was no surprise to see Osasuna frequently deliver the ball into the Villarreal penalty area especially from long throws in an attempt to benefit from their aerial superiority. The problem for Osasuna is a propensity for long, high balls yet they play Nino, a small forward, centrally. As a consequence, Villarreal, although somewhat scrappy at times, were able to deal with the high balls and Osasuna gained little from this direct approach. They had just 9 attempts at goal in the whole game and their equalising goal was an excellent long range strike from, yet again, Raul Garcia. Garcia had four of the nine Osasuna strikes at goal. He is the club’s top goalscorer with ten goals this season and the main creative force with eight assists. He is also only on loan from Atletico Madrid and although a permanent recall under Simeone may be unlikely, his form only serves to increase his value, possibly outwith of Osasuna’s reach. Under Garrido and with Cazorla in the team, Borja Valero previously played as one of the pivots in front of the back four where he was always available to receive a pass and recycle the ball quickly to a team mate in space. His positional sense and passing range were essential components in the yellow submarine. This season, with Cazorla gone and both Bruno and Senna full fit, Valero has adopted a range of positions. From initially being deployed as an interiore, in an attempt to replicate the same system without Cazorla, to a more advanced central position against Osasuna where Valero played behind Marco Ruben but with the freedom to move both laterally and vertically. 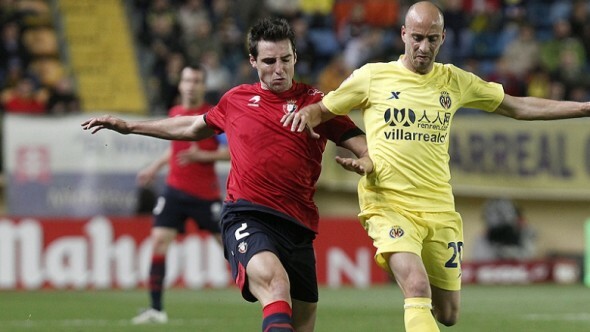 Valero was involved in almost all of Villarreal’s constructive attacking play and overall, had an excellent game. He often broke beyond Ruben but was also found tracking back and undertaking more than his fair share of defensive duties. Was Valero trying to do too much? He is arguably a more effective player as a defensive pivot but the alternatives in attack for Villarreal are de Guzman and Camunas who have both disappointed this season. Looking ahead, does Borja Valero require a change of scenery to break back into the Spain squad and elevate his game to the next level?